Massachusetts' Luwane Pipkins shoots a 3-pointer over Maine's Dennis Ashley (32) during the first half of an NCAA college basketball game Friday, Dec. 22, 2017, in Amherst, Massachusetts. 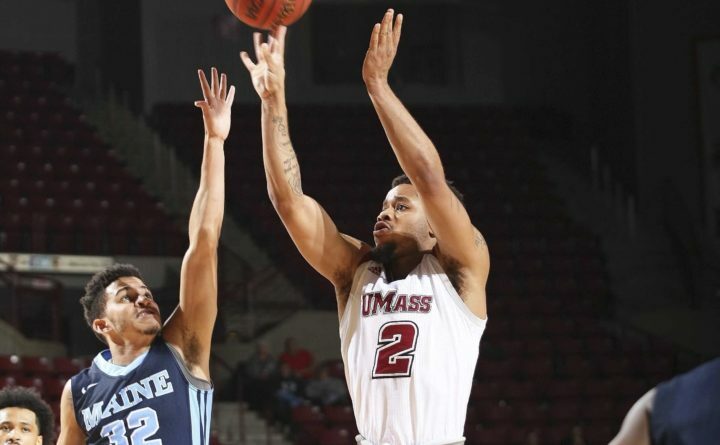 The transition continues within the University of Maine men’s basketball program, as two more players from the 2017-2018 team have reportedly declared their intent to transfer in the aftermath of the Black Bears’ recent coaching change from Bob Walsh to Richard Barron. Junior guard Vernon Lowndes Jr. and redshirt sophomore guard Dennis Ashley both hope to continue their careers elsewhere next season, according to verbalcommits.com, a website that tracks college recruits and transfers. Lowndes Jr., a 6-foot-5-inch native of Charleston, South Carolina, spent two years attending junior college in his home state before joining UMaine this season, when he averaged 6.5 points and 3.3 rebounds in 16.1 minutes per game in 29 contests, including six starts. Ashley, a 6-foot-1-inch product of Los Angeles via Bridgton Academy, came off the bench in 31 games this season, averaging 3.9 points in 13.1 minutes per game for the 6-26 Black Bears. Lowndes Jr. and Ashley bring to five the number of players from the 2017-2018 team who have expressed interest in leaving the program since Walsh was replaced on March 5 by Barron, the university’s former women’s basketball head coach. UMaine was 24-100 over the last four seasons. Redshirt junior guard Aaron Calixte, a third-team All-America East choice this season after averaging a team-leading 16.9 points for the Black Bears, plans to play elsewhere next winter as a graduate transfer, a status that would allow him to transfer without having to sit out a year before returning to action. Two other guards, junior Trae Bryant and sophomore Danny Evans, also have expressed interest in transferring to another program. The transfers would leave Barron with a returning nucleus that includes frontcourt players Andrew Fleming, Ilija Stojiljkovic, Vincent Eze and Miks Antoms and guards Isaiah White, Dusan Majstorovic and Celio Araujo. Two prep players, Maine’s reigning Mr. Basketball Terion Moss of Portland and 6-8 Jonathan Komagum of London via TaylorMade Academy in Pensacola, Florida, have made verbal commitments to join the Black Bears next fall. The spring National Letter of Intent signing period begins April 11. One of UMaine’s most successful former men’s basketball coaches is now without a job. La Salle University and Dr. John Giannini, the Explorers’ head coach for the last 14 years, have mutually agreed to part ways, according to a press release. Giannini arrived at La Salle in August 2004 after eight years at UMaine and in his second season at the Philadelphia school led the program to its first winning season since 1992-1993. La Salle won 21 games during the 2011-2012 season and went to the NIT, and the next season the Explorers won 24 games and not only earned the school’s first NCAA berth since 1992 but advanced to the Sweet Sixteen and finished the year ranked 24th in the country. La Salle went 13-19 this season, the Explorers’ third straight sub.-500 finish. Giannini arrived at UMaine in 1996 after leading Rowan University of Glassboro, New Jersey, to the NCAA Division III championship earlier that year. After two 20-loss seasons with the Black Bears, he used the support of such transfers as former Mountain Valley of Rumford standout Andy Bedard and Nate Fox (both via Boston College) to turn the program around. UMaine won 19 games during 1998-1999 season before posting a 24-7 record the following year. He added a 20-10 season in 2003-2004 before taking the La Salle post.